If you work in North Phoenix near I-17 and Happy Valley Road or Pinnacle Peak road, you are probably aware of the long waits to get on and off the freeway every weekday between 3pm and 6pm. The long wait times and backups are frustrating to many drivers, but a new plan recently unveiled by the Arizona Department of Transportation may resolve the daily congestion in a unique way. 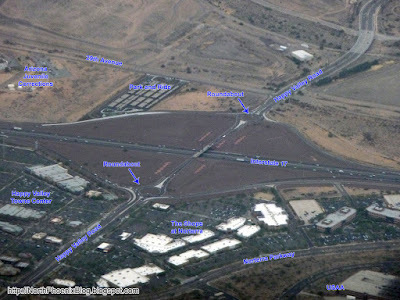 Recently, ADOT announced a proposal to replace the Happy Valley interchange with a new type of system called a diverging diamond. A cost estimate has not yet been provided. If approved, the new interchange could begin construction as soon as 2018. Aerial Photo of the current I-17/Happy Valley Roundabouts. Currently, the Happy Valley Road exit has two roundabouts which were completed in 2001 at a cost of $2.2 million. At the time, these were touted as a safer and more economical to a traditional interchange, which would have cost between $8 and $12 million. While the roundabouts are safer, they are not an ideal solution for the volume of cars in the area. New home construction, job opportunities at USAA, Cigna, and W.L. Gore, and two major retail shopping centers have added tremendous growth to the Norterra/Happy Valley area since 2001. ADOT has acknowledged that "a diverging diamond interchange would be better able to manage the growing volume of traffic at Happy Valley Road and reduce the amount of time drivers spend waiting at traffic signals." Relatively few of these diverging diamond interchanges have been built in the U.S. so far, with approximately 80 diverging diamonds completed in 26 states since 2009, according to the ADOT article. They work by diverting the flow of local traffic to the opposite side, allowing for direct entrances to freeway ramps without waiting for an additional signal. Example of a diverging diamond interchange. 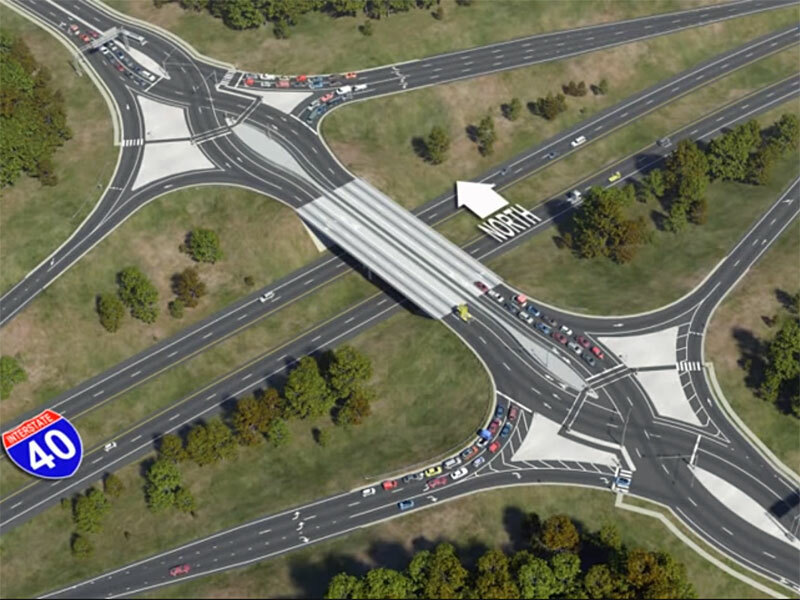 The advantages of the proposed interchange include less time waiting, less fuel wasted, and dramatic safety improvements due to fewer potential points of conflict. The design is supposed to be even more efficient than a roundabout, which was originally built as a superior design to a traditional 4-way intersection. The proposal also calls for replacing the interchange at I-17 and Pinnacle Peak Road, which is a narrow two-lane bridge constructed in 1964. ADOT is also considering divided diamond interchanges at two other locations, both along the Loop 202 South Mountain Freeway. Read the original ADOT News Release.